Problem #1: You are playing too many notes, without refining each lick you play. This makes your guitar licks sound less expressive than they can be. Problem #2: Allowing your hands to outrun your brain. This means your hands play faster than your brain can create the next guitar solo idea. Thinking ahead when improvising and make the best musical choices becomes hard... Sound familiar? Reduce the number of things you think about. This helps you make the best musical choices in your guitar solo and express yourself fully. Many guitarists wait too long to start planning their next phrase. All the thinking starts at the last possible moment (usually on the last note of the current lick). This leaves you very little time to decide what to play next. You should start thinking much earlier. Example: If you improvise an 8-note phrase, do NOT wait until note 7 or 8 to plan your next phrase. Begin thinking about the next phrase as soon as your hands are in position to play the first note of the first phrase. Let your hands play the first phrase on autopilot and free up your conscious mind to make the best musical choices for the next one. Most guitarists play each phrase only once and immediately move on to create a brand new guitar lick. This process continues for their entire guitar solo. Creating brand new phrases nonstop is a big challenge for your brain. It also makes playing guitar with emotion very hard. Solution: Create lots of variations on each guitar lick you improvise. 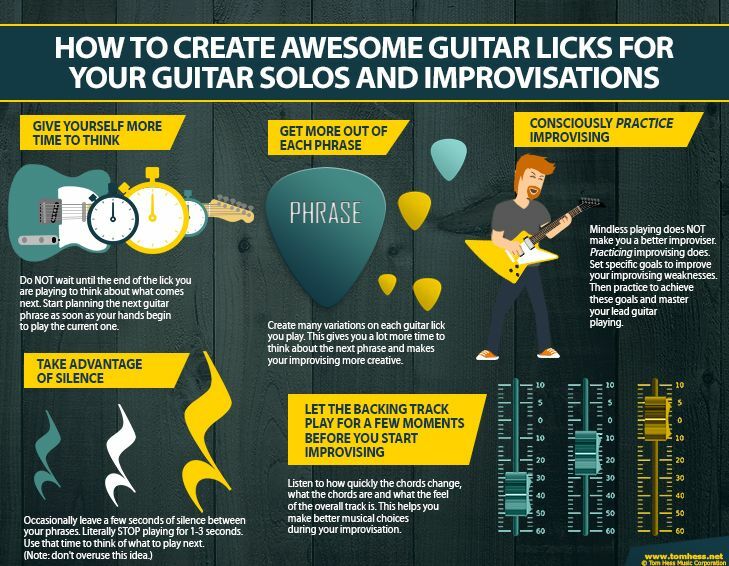 This gives you a lot more time to think about what to do next, helps you to play each guitar lick with the best phrasing possible and makes your improvising more creative. Repeat the phrase over and over with different rhythms (keep all the pitches the same). Repeat the phrase and change its notes (keeping the rhythm the same). Change some of the rhythm and some of the pitches. Change how the vibrato is applied. Add new ornaments to some of the notes (slides, bends, double stops, trills, etc.). Sequence the phrase up or down the scale. This requires advanced fretboard visualization skills. (Note: you can combine these ideas together to create hundreds of possible guitar phrasing ideas from a single lick). You can play your variations one after the other before moving on to the next phrase. You can also hold back some of the variations you create and use them later in the solo. Either approach works extremely well. Creating variations makes it much easier for your brain to keep up with your hands (even when you play very fast). Lead Guitar Improvising Tip #3. Learn The Difference Between Improvising And Practicing Improvising. Mindlessly improvising to a backing track does NOT make you better at improvising. Practicing improvising does. To practice improvising, set specific goals to achieve during your practice time. These goals depend on your specific lead guitar playing strengths and weaknesses. An expert guitar teacher helps you identify your improvising challenges and set specific goals to overcome them. Practice improvising using positions 4, 5 and 6 of the Harmonic minor scale. Practice starting and ending all your guitar licks only on consonant pitches (notes that are in the chord you are playing over). Apply scale sequences (or a single scale sequence) into your improvising. Improvise under self-imposed restrictions. (Example: improvise only using 1 string or using only arpeggios or only non-adjacent strings). This makes improvising harder and forces you to become more creative. Your improvising goals must be very specific, so you can tell when each goal is reached. The more specific the goal, the faster your improvising improves. This free eBook shows you how to play guitar licks with fire and emotion. 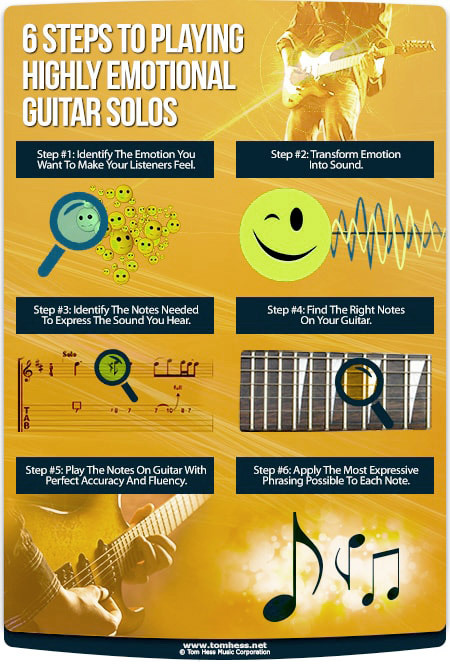 Want more time to think about what to play next in your guitar solo? Leave a few seconds of silence between your phrases. Literally STOP playing for 1-3 seconds. Use that time to think of what to play next. Yep, it’s that easy. You do not have to be playing something 100% of the time in your solo. Good improvising is about balance. You balance consonance and dissonance, tension and release, silence and sound. This helps you to express the emotions you want your listeners to feel. Using silence also adds A LOT of musical tension to your guitar solo. Your listeners expect to hear notes (sound). When they hear silence instead, it goes against their musical expectations. This builds tension. Learn more about building musical tension in your guitar solos. Note: Be careful not to overuse this technique. This phrasing style loses its effectiveness when overdone. 1. You learn how quickly the chords change, what the chords are and what the feel of the overall track is. This helps you make better musical choices during your improvisation. 2. It (usually) sounds better to delay the start of the solo and let the listener hear the backing track. This simple tip makes improvising a lot easier and helps your guitar solos sound better. Pitch range refers to the distance between the highest and lowest note in a guitar lick or solo. Playing in a different pitch range of the guitar helps you create new improvising ideas. Avoid playing at the extreme ends of the pitch range of your guitar too early in your solo (the highest frets or the lowest frets). Leave some pitch range in reserve. This gives you room to develop your guitar solo, build musical tension and keep your listeners engaged longer. This also gives your brain more time to think about what to play next. Tip: study your favorite guitar solos and analyze their use of pitch range. You will find that most guitar solos start in the middle of the pitch range and gradually expand to cover the rest of the guitar. Note: mastering fretboard visualization allows you to fluently play all over the guitar and manage the pitch range of your guitar solos. Implement these tips to create lots of new guitar licks and become a much better improviser. Want to make every guitar lick you play drip with fire and emotion? Download this free lead guitar playing eBook to learn how to play guitar licks and solos you’ll be proud to call your own. Study the best electric guitar lessons on the web.